Where you reside and where you choose to build your Precision Craft home may be two different locations. In the United States, for example, approximately fifty percent of our clients design and build their luxury homes somewhere other than their current state of residence. Over the last (nearly) thirty years, we have come to know some regions of the world more than others. This is because our clients often determine their homes’ future locations using similar considerations, i.e., weather, view, metropolitan access, privacy, permitting, et cetera. Consequently, this selection criteria led to several regions around the globe where Precision Craft returns time and time again. It is for this reason we are highlighting certain corners of the world in a series of articles. In our previous installment, we shared the many benefits of America’s Pacific Northwest region, specifically, Puget Sound in Washington. The system of estuaries is one of Precision Craft’s busiest building areas as of this writing. Indeed, several custom homes are in various stages of planning, designing, and building. If you missed the feature on Puget Sound, click here. This article shares the sure appeal of America’s “Centennial State,” Colorado. We hope you receive insight into why you may wish to consider Colorado for your luxury Precision Craft residence. Colorado is home to more Precision Craft luxury residences than any other state in America (i). 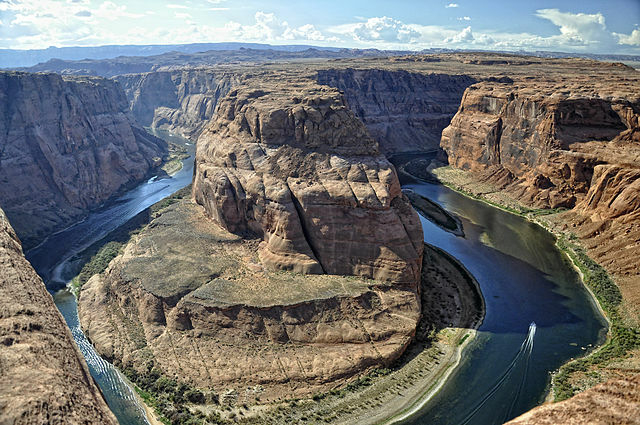 Famous for its significant share of the Rocky Mountains in its western half; arid, high plains in its eastern half; and the dramatic waters of the Colorado River, Colorado is quintessential “American West.” With less than six million people in a space of approximately 270,000 kilometers squared, (just under 105,000 square miles), Colorado’s storied peaks, plains, and rivers attract millions of visitors year-round. It is no exaggeration to write: Colorado has something for everyone. Noted for its diverse geography, the state offers any view one’s heart desires. It also affords as much (or as little) privacy as desired. Its world-renowned ski slopes, cultural amenities, and Western America rugged appeal are only enhanced by its adjacency to the American Midwest’s congeniality, an attitude Colorado easily embraces. Additionally, Colorado’s complex climate means micro-climates abound (Clotfelter, 2008), allowing you to (within reason) determine what you wish to experience as it relates to wind, thunderstorms, and yes, even snow. Avid skiers can expect powder galore by selecting a parcel in the mountainous western half of the State while those with water activities at the top of their list will find satisfaction in land abutting one of Colorado’s many rivers, reservoirs, or lakes. Regardless of where your passions lie, your Precision Craft home will perfectly match your property and your lifestyle. What Should You Build In Colorado? 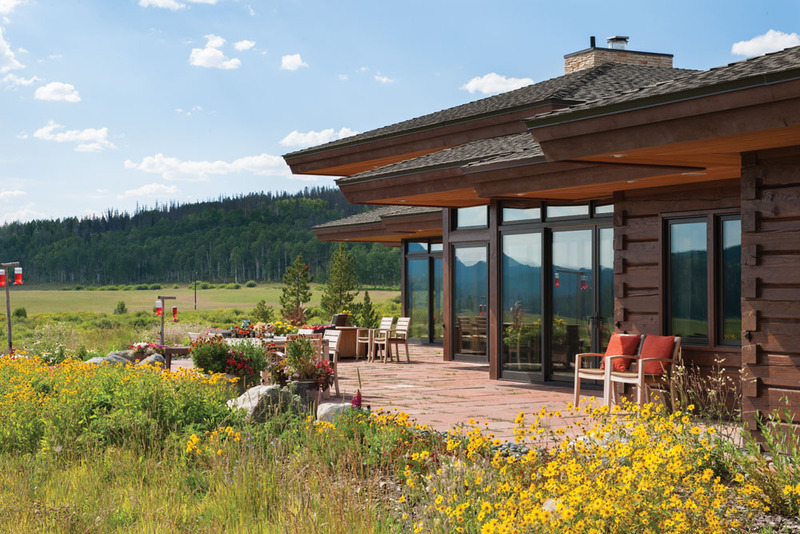 It will come as no surprise that traditional, mountain style homes comprise the majority of Precision Craft’s Colorado projects(iii). This is partially due to our well-known expertise in designing and building luxury log and timber mountain style homes. But, Colorado itself has a defining role here as well. The state’s landscape, though undeniably diverse, has a common, underlying feel to it of being wholly American. Thus, our complete range of authentic mountain style homes and full complement of materials beautifully blend into Colorado. 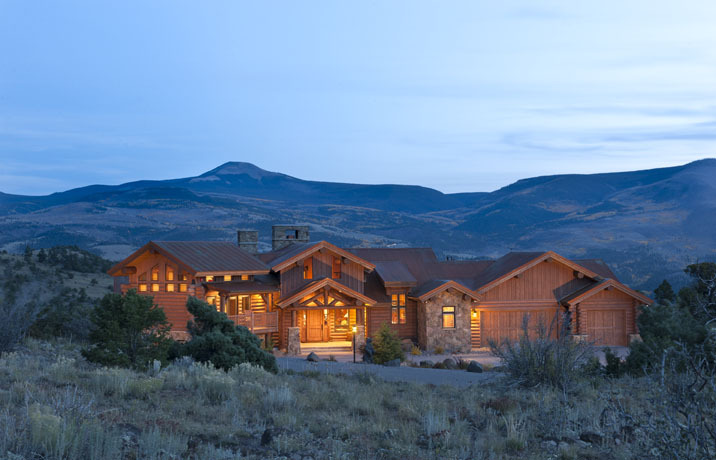 Let us explore and compare two mountain style, luxury projects in Colorado. 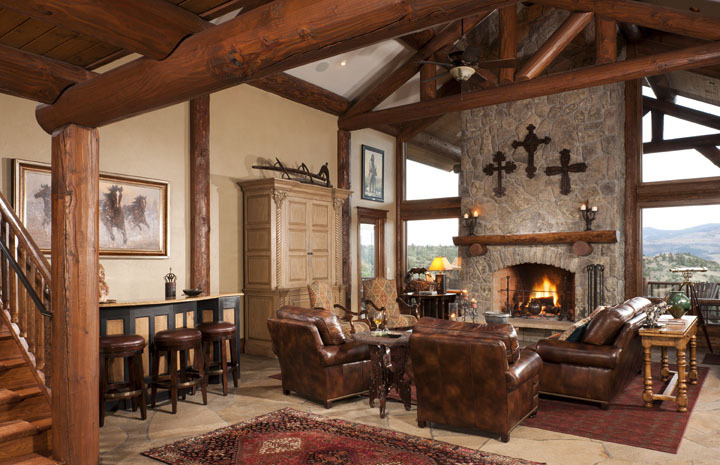 The Evergreen, Colorado handcrafted log post and beam luxury home shown above was featured in Log Home Living magazine’s “Best of…” issue the very year it was built. Its traditional, rustic appeal is enhanced by textures such as stone and vertical siding. Should you decide handcrafted log post and beam is of interest to you, please visit the gallery of this “Excellence in Log Home Design” winner (iv) here. Unlike the Evergreen residence, the South Fork, Colorado luxury home seen below showcases the stunning possibilities of milled logs. This home’s stone chimney, shed dormers, and cascading roof line nod to our Appalachian Legacy architectural style, though it is at home in any mountain range. 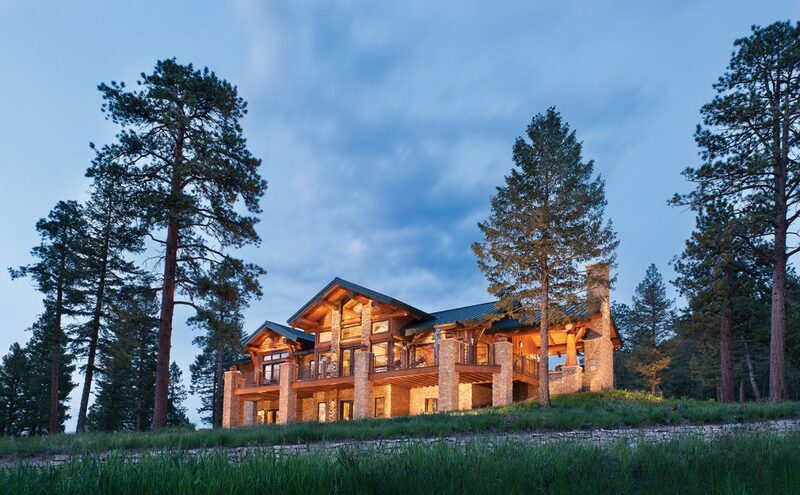 Awarded the National Association of Home Builders, Building Systems Councils “Excellence in Log Home Design”, this home’s interior, including its massive log posts, should not be missed. Its great room is shown below. See the complete gallery here. Our in-house architectural designers at M.T.N Design have, in fact, earned so many awards from Colorado homes, (see here, here, and here), that the state itself could be considered a good-luck charm, a thought Precision Craft Colorado client representative, Todd Gailey, does not deny. With over 20 years of experience at Precision Craft, Todd Gailey has represented hundreds of clients in Colorado. Over time, Todd has come to believe Colorado is special indeed. “Our Colorado homes seem to stand-out,” he admits. “I don’t know if it’s the scenery or our clients, but these homes have a certain flair when they are finished.” Todd says he enjoys his frequent travels to Colorado, always looking forward to meeting new clients. He says clients who are less familiar with the state are an added delight, explaining, “Most people think of the Rocky Mountains and famous resorts like Aspen when they hear Colorado, but there are great places to build all over the state.” With his long Precision Craft tenure and 200-plus Colorado luxury projects to remember, Todd can help you build or find a builder for your log, timber, or hybrid home. Contemplating Colorado for your Precision Craft project? You may wish to connect with Todd on LinkedIn here. Creating custom luxury homes is intrinsic to Precision Craft. We look to nature, and the materials found there, to design our signature homes. When we are in Colorado, we are never short on inspiration– and you won’t be either. Request a visit to your site here. Please return in two weeks when we discover the Blue Ridge Mountains of the eastern United States. (i) PrecisionCraft has nearly 300 finished homes in Colorado. (iii) Not all Colorado projects are log homes or traditional mountain style. See a timber frame Steamboat Springs residence here. View the artistic rendering of the more modern Silverton conceptual design, here.